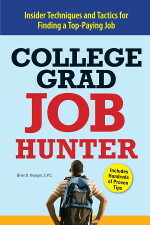 College Grad Job Hunter is the best selling book for entry level job search for college students and recent grads. This book has launched thousands of college grads on the path to career success. It provides far more than the standard information found in many of the generic job search books available today. It provides information specific to you, the college student and recent grad, to guide you in your job search. You are given the tips, techniques, and tactics that will set you apart from the crowd. Following the recommendations in this book will give you a distinct competiive edge in today's very competitive entry level job market.